The 27-year-old world number three lost her place at the top of the women's game following Naomi Osaka's Australian Open victory in January. But after Osaka's shock exit in the third round in Miami, Halep can return to the top if she takes the title. She will also go top of the rankings if she reaches the final and loses to anyone other than Czech world number two Petra Kvitova. Kvitova faces France's Caroline Garcia in the fourth round. 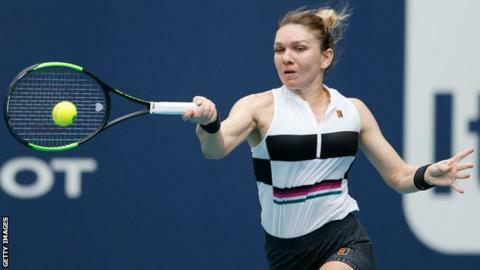 "She played unbelievable and it was such a tough match," said Halep. "It was good to play for almost three hours though. I slowly found my rhythm but I always had belief so if I can keep doing this, I will have a good tournament."